MANSOURA, Egypt — A skeleton has been unearthed in Egypt's Western Desert, where ancient sands have long helped preserve remains, but unlike most finds this one isn't a mummy — it's a dinosaur. "As in any ecosystem, if we went to the jungle we'll find a lion and a giraffe. So we found the giraffe, where's the lion?" 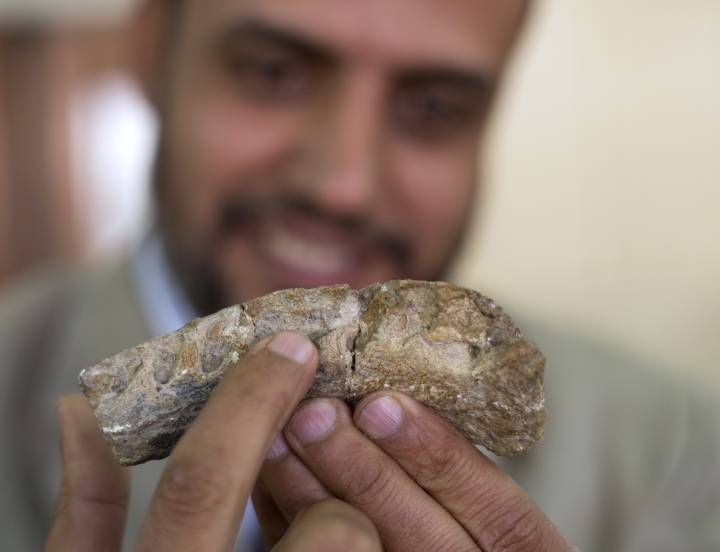 said Hesham Sallam, leader of the excavation team and head of the university's Center for Vertebrate Paleontology. Experts say the find is a landmark one that could shed light on a particularly obscure period of history for the African continent, roughly the 30 million years before dinosaurs went extinct, between 70 million and 80 million years ago. Named "Mansourasaurus Shahinae" after the team's university and for one of the paleontology department's founders, the find is the only dinosaur from that period to have been discovered in Africa, and it may even be an undiscovered genus. In the article the authors say the team's findings "counter hypotheses that dinosaur faunas of the African mainland were completely isolated" during the late Mesozoic period. Those theories were that Africa's dinosaurs during that time existed as if on an island and developed independently from their northern cousins. But Mansourasaurus' fossilized skeletal remains suggest an anatomy not very different from those discovered in Europe from the same period, an indication that a land connection between Africa and its northern neighbor may have existed. The news was welcomed by other paleontologists, who now see the desert to the west of the Nile as fertile ground for new information about the Earth's former residents. Kristi Curry Rogers, an associate professor of geology and biology at Macalester College who specializes in large long-necked dinosaurs like the Mansourasaurus, said Tuesday that the find's strong pronounced chin and other unique anatomical quirks will help piece together the evolutionary history of dinosaurs in Africa once more fossils have been found to compare it with. "This highlights how much there is left out there to discover," she wrote by email. 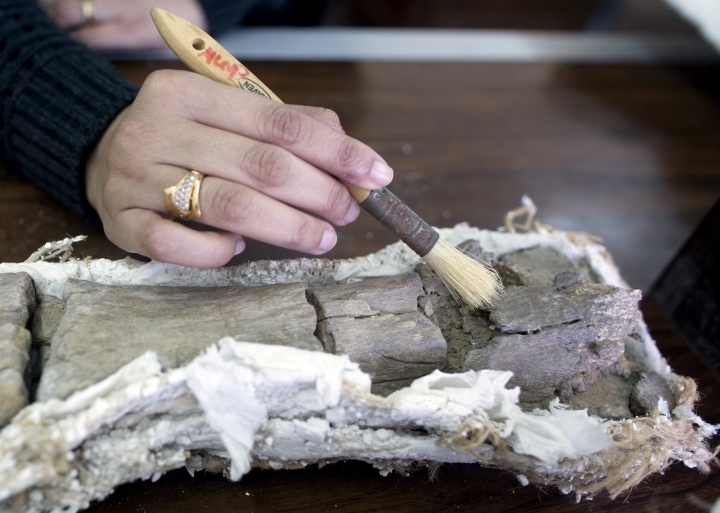 "And I'm excited that people like Dr. Sallam and colleagues are on the ground searching for fossils." 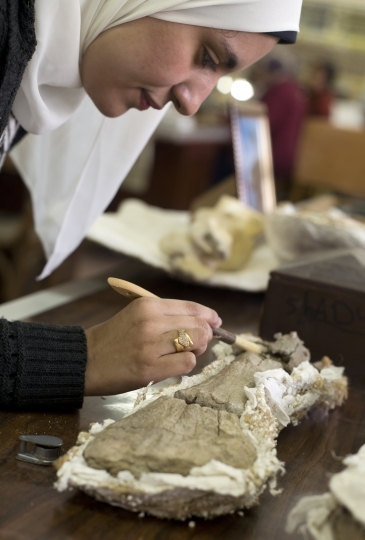 While Egypt has a long history of archaeology, paleontology has not enjoyed the same popularity — or had the same success. In 1911, German paleontologist Ernst Stromer led an expedition to the oasis of Bahriya in the Western Desert. There, he discovered four species of dinosaurs, including a predatory type known as the Spinosaurus, all from the Cretaceous period. But all of his findings were later lost in Allied bombing of the Munich Museum during World War II. Sallam said researchers don't know how Mansourasaurus lived and died, except for the fact that it was a plant eater. There's no indication whether it lived alone or in a herd. 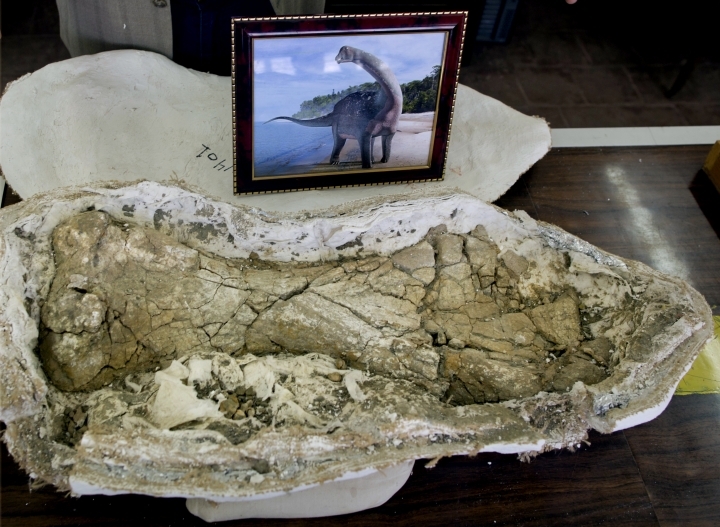 The bones bear a resemblance to another dinosaur discovery in Egypt, that of the Paralititan Stromeri, excavated by an American team from the University of Pennsylvania, whose findings were published in 2001. Both were long-necked herbivores grazers, but the Paralititan Stromeri was much larger. It was among the largest known dinosaurs, weighing in at 75 tons and over 30 meters (33 yards) long. The Mansourasaurus' smaller size is more typical of the Mesozoic era, when dinosaurs' time was running out, geologically speaking, Sallam said. With a long neck and tail, its torso would have been similar to that of an African elephant and measuring tip-to-tale over 10 meters (11 yards) and weighing several tons. The Western Desert would have more closely resembled a coastal jungle during the dinosaur's lifetime, with half of what is the country today under water. Finding the dinosaur remains in the vast desert was the product of back-breaking work. The team scoured the area of the find more than 750 kilometers (466 miles) southwest of the capital for five years before they found the partial skeleton of the Mansourasaurus in 2013. 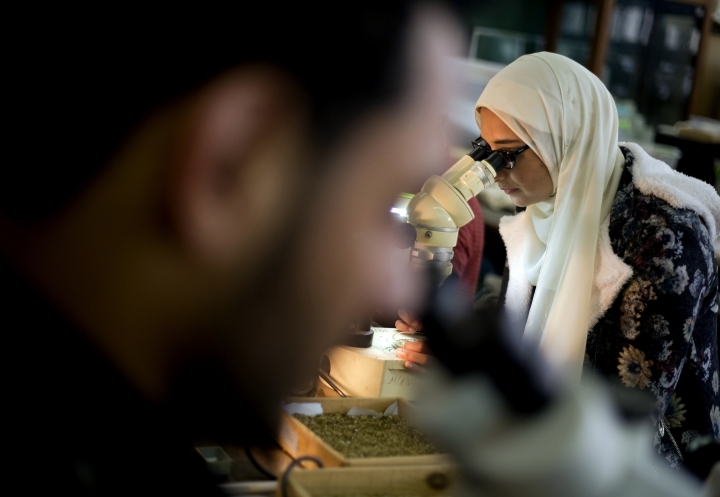 Sallam said he and a group of doctoral and master's degree students were heading to give a lecture at a local university when they stumbled on a desert road with the appropriate geological outcroppings that they hadn't noticed before. The next morning, the team returned to survey it, covering an area of several kilometers. It wasn't long after they started that one of the students called him on the phone, saying he should come see the number of bones she'd found. "When I first saw it I told them, 'If this comes out as I expect, your names will go down in history,'" he recalled. 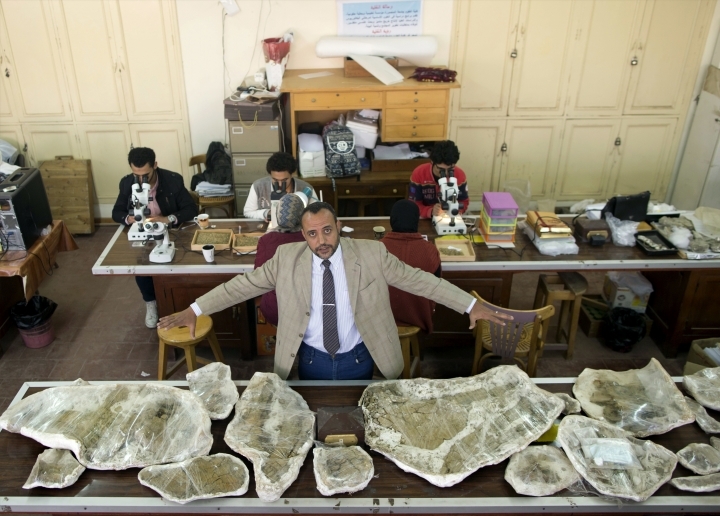 There is some hope the discovery could bring more funding for the paleontology field in Egypt and financing for current studies, Sallam said. But he said he's most proud of making science real for people who otherwise aren't exposed to it as much. 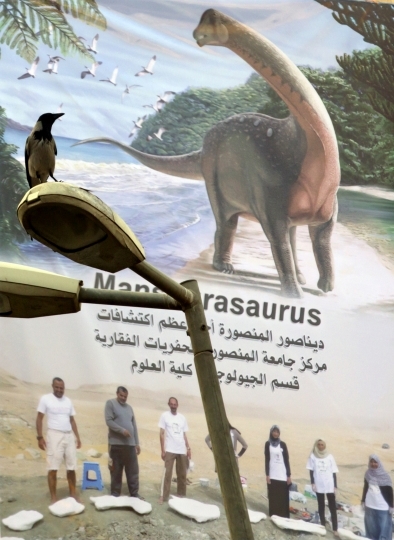 "I mean, we've made the average Egyptian man, or the Arab man, talk about dinosaurs," he said.